Publisher: John Redmayne, London, 1673. Very scarce. Condition: Hardcover, full leather. Looks like it has been through hell. Wear and rubbing throughout, front hinge very tender but holding, interior nice and generally clean except previous owner’s marks on illustrated title page and front blank. Great little book that shows just how similar human beings are, even separated by a period of 2000 years. Read more here. Factorum ac dictorum memorabilium libri IX (“nine books of memorable deeds and sayings”, also known as De factis dictisque memorabilibus or Facta et dicta memorabilia) by Valerius Maximus (c. 20 BCE – c. CE 50) was written around CE 30 or 31. It is a collection of approximately a thousand short stories that Valerius wrote during the reign of Tiberius (42 BCE – CE 37). The stories are a variety of anecdotes illustrating how the ancient Romans lived. While the majority of the stories are of Roman life, he does have some foreign stories at the end of some chapters. Most of these are of Greek life and most of those are about Greek philosophers or famous kings. Several of the stories relate to moral subjects that parallel those in the Old Testament and New Testament. 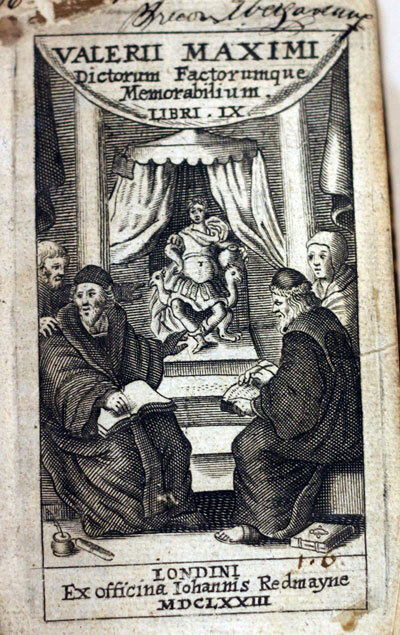 Valerius refers to his moral stories as “examples” that were to be used as moral guidance. Valerius’ work on the preservation of moral values of the Roman Republic of the past was widely popular through the Age of Enlightenment, a literary life-span of some 1,700 years. People read Valerius’ work for practical guidance in their everyday tasks for living a moral life. This work was especially used as a reference by writers and professional orators. It is estimated that Valerius’s work on these nine books took over a decade. He obtained material from Cicero, and from Livy, Sallust, Pompeius Trogus, Marcus Terentius Varro and other ancient historians. Each of the nine books has several chapters. Each chapter is outlined and grouped thematically and contains several stories illustrating that theme. 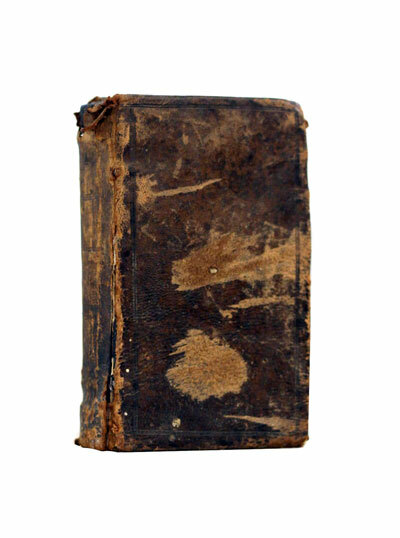 This work is the earliest known use of a hierarchical organization system for topics of a book. There are a total of 91 chapters covering a wide variety of subjects drawn from Roman life. 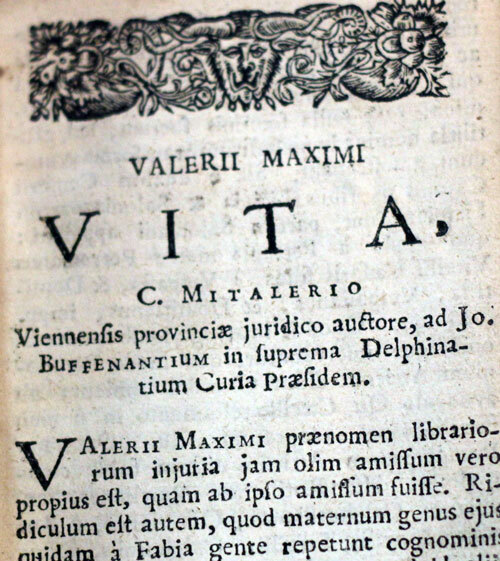 Valerius arranges his chapters focused on particular virtues, moral and immoral habits, religious practices, superstitions and ancient traditions. There is a thematic guide at the end of the work.